SURVIVE! : Paramount Pictures Presents Suffering As Holy Communion – Schlockmania! 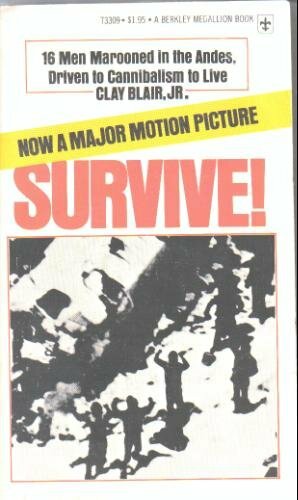 B-movie historians usually point to the success of Jaws and Star Wars sounding the death knell of exploitation cinema. However, a look at the larger picture reveals that Hollywood had been hip to exploitation trends ever since Easy Rider and used b-movies to pad out their bottom line throughout the 1970’s. 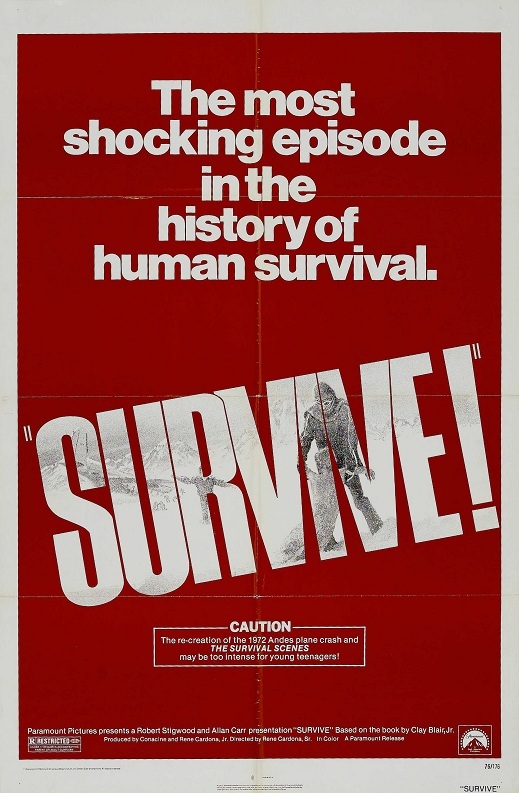 A great example of this trend in action is Survive!, a re-edited and re-dubbed Mexican film that became the surprise summer hit of 1976 for Paramount Pictures. Survive! took its storyline from a real-life tragedy. 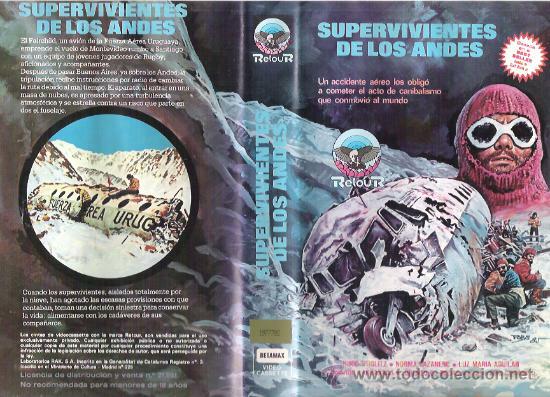 The plot revolves around a 1972 incident in which a plane carrying a Uruguayan rugby team strayed far off course and crashed in the Andes mountains. The survivors do their best to stay alive while waiting for help. However, the authorities call off the search after a while and the food supply runs low. 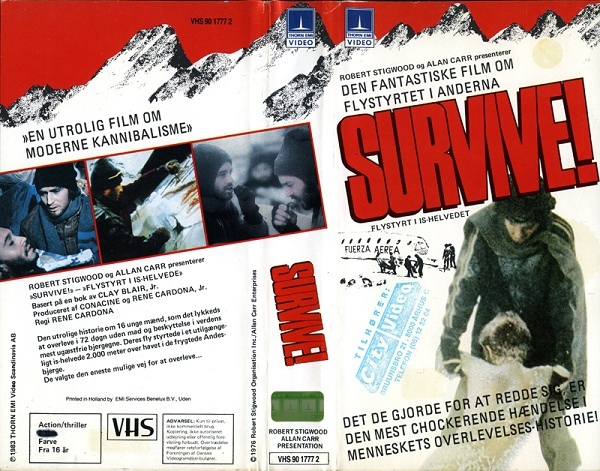 The dwindling group of survivors is forced to grapple with a horrible set of choices: will they starve to death or will they resort to cannibalism to stay alive until they can be rescued? It’s worth noting that this incident also inspired the classic book Alive and its subsequent film version in the 1990’s. However, Survive! eschews the philosophical, life-affirming elements of that higher-minded version of the story to steep itself in the viscerally depicted suffering of its heroes. This approach is no surprise when you consider who made the film: it was the father and son team of Rene Cardona Jr. and Sr., Mexican exploitation specialists whose filmography includes the MST3K favorite Santa Claus, Night Of The Bloody Apes and Guyana: Cult Of The Damned (another headline-sploitation classic). The exploitation training of the Cardona’s can definitely be felt in Survive! Every reel, there is some bit of physical torment designed to make the audience squirm: memorable moments include one passenger trying to help another get a piece of intenstine back into a stomach wound, another scene where a razor blade is used to drain the pustules on an infected leg and, of course, the infamous central images of a corpse being flayed and the subsequent eating of dried flesh that follows. And yet, Survive! is not a goreshow despite the aforementioned catalogue of carnage. In fact, the gruesome stuff is just a few minutes total out of the overall running time. What gives these moments their gut-punch effectiveness is the film’s morbid, single-minded focus on the suffering of its heroes. Much of the running time is devoted the emotional and psychological anguish that accompany their physical torments. Every time there is a moment of hope, a quick extinguishing of that hope follows. Any time they start to come to terms with their situation, a new problem rears its head. The centerpiece of this banquet of suffering is the set of sequences where the survivors decide to resort to cannibalism. They are neither as hysterical in tone nor as gory as you might expect. Instead, they have a solemnity that is downright hypnotic. 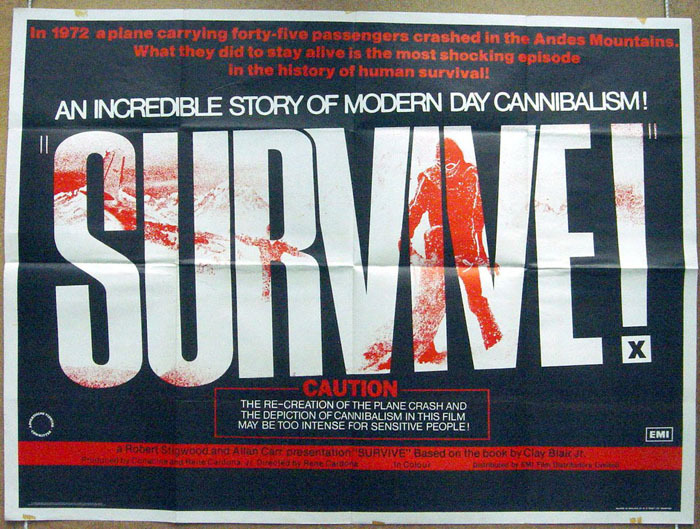 The Cardonas knew they were targeting a very Catholic Latin-American audience and these moments are treated like a real-life version of “drink of my blood/eat of my flesh” communion imagery, right down to a zoom in on a prayer-chanting survivor clutching a crucifix and prayer beads as the survivors grimly take and consume the flesh of one of their dead. The focus on suffering is doubled in the version Paramount released. Allan Carr, future producer of Grease and the man responsible for bringing it to the U.S., saw the film as an exploitation item and cut almost a half-hour out of the original Mexican version. 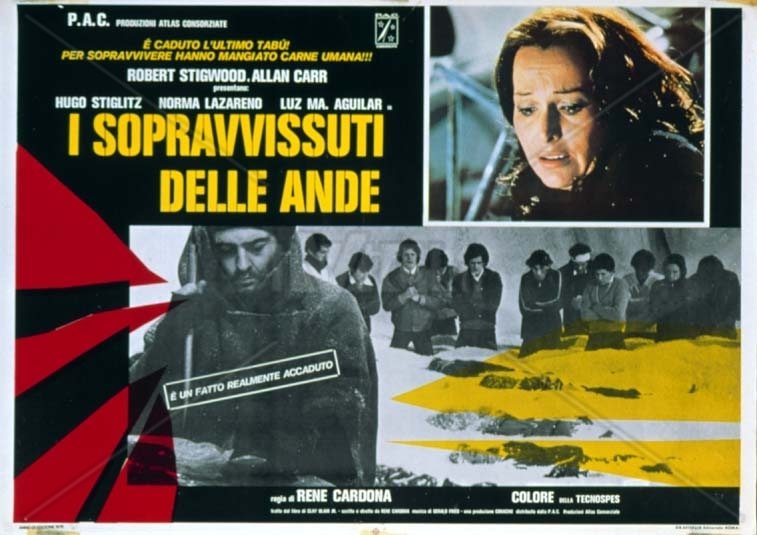 Thankfully, this is a rare case where such extreme editing helps: the Cardonas had a tendency to let their films run overlong during the 1970’s and the cuts here remove a lot of plot padding, mainly stuff related to the search for the survivors. The film was also completely redubbed and rescored. The end result is not what you might call “good” in the conventional sense: characterization is negligible – the audience doesn’t even get names for any of the cast until the film is halfway over – and the moral themes briefly raised before the cannibalism scenes are doled out in a simplistic, comic-book fashion. However, what remains comes through with a concentrated strength that never lets up on the viewer. The Carr-driven additions help: the gloriously hammy, wall-to-wall orchestral score from Gerald Fried serves the purpose a main character might serve, cueing the audience on how to respond, and some intermittent narration enhances the gloomy high-stakes feel of the story (it’s the doom-iest narration since The St. Valentine’s Day Massacre). In short, if you want to find the uplifting side of a tragedy and gain insight into the human condition, you should probably stick with Alive. However, if you want one of the great examples of Hollywood-retooled exploitation, Survive! is the gem you seek. Its style and technical elements may have aged but its grim attitude still hits the audience where it hurts. Next ArticleTHE BOSTON STRANGLER: The Roots Of The Modern Serial Killer Movie?